We pause at this milestone 400th issue of the �Nome Static� with a special prayer of thanksgiving. made our mission possible for these many years, and who continue to keep our signal strong. Thank you! May Our Lord bless you many times over for your generosity. THE GABRIEL! THE GABRIEL! We�ve just learned that KNOM has won the �Radio Station of the Year� Gabriel Award for the fourth straight year! See page three, inside! top A REALLY BIG BOOST! As KNOM office assistant Connie Albers demonstrates, the antenna boosters which KNOM has been distributing in the villages make a solid improvement in how well people hear our signal. As you know, we distributed them through a contest. mid-June, village response was so incredible that the Diocese of Fairbanks agreed that we should spend an additional $10,000 to keep the contest going. At the end of June, we have given a total of 710 of these boosters, plus 75 high-powered receivers. We�ve sent these boosters into 43 villages, including a few distant ones where we didn�t know we had listeners! Amazingly, thanks to this project, there are four villages where more than 50% of the households now have one of these boosters. In 21 villages, they�re in over 10% of the homes. Please write to general manager Tom Busch if you�d like a complete listing of villages and percentages. It was a fabulous successbut we�re now $10,000 short. Would you like to help? Only one-third of the many villages within reach of the KNOM signal have water and sewer systems most people haul water from rivers or ponds and use �honeybuckets� at home. In the few villages which do have piped water and sanitation, up to one-half of the homes are not connected. THANK YOU for your offering of prayers and your concern for 1966-1984 KNOM business manager Therese �Tweet� Burik, who suffered a serious head injury in April. We are happy to report that Tweet is dramatically improved, although she continues to have difficulty reading and speaking. Please continue to keep her in your prayers, won�t you? INSPIRATIONAL SPOT: Once we know God�s truth, there are no longer any questions. top GOODBYES: Earlier this year, we caught this photo of (from left) business manager Florence Busch recording an educational spot with volunteers Jodi Engle and Vicki Muzik. Both volunteers completed years of service in June, and have departed for jobs in Alaska broadcasting! Jodi�s settling in as news reporter for KYUK radio in Bethel, in the southern fringe of KNOM�s coverage area. Please join us in wishing these wonderful young women success and happiness. INSPIRATIONAL SPOT: The presence of Christ in the Eucharist is God�s wordless act of love. Communion is like somebody you love being with you. Hugging you. Listening. Just being there. Yes, the Eucharist is an infinite act of love. BULLETIN! BULLETIN! At press time, we learned that KNOM is one of 5 stations which have been nominated by the National Association of Broadcasters for their Marconi Award as �Religious Station of the Year!� The winner will be announced on September 2nd. WILLFULLY: Many of KNOM�s friends have remembered our mission in their wills. These final acts of kindness have made many wonderful projects possible, such as our power increase and our 24-hour operation. Please consider adding missions like KNOM into your will. INSPIRATIONAL SPOT: People are like stained glass windows. They sparkle and shine when the sun is out, but when darkness sets in, their true beauty is revealed only if there is light within. Full size YOUNG! That�s Alaska�s sole U.S. 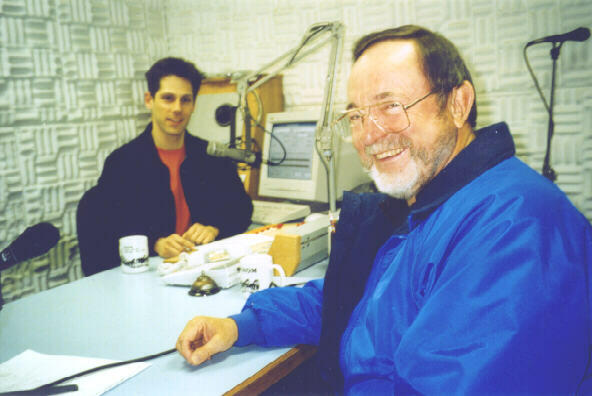 Congressman Don Young, chatting with KNOM news director Paul Korchin during a visit to Nome. Young was keynote speaker at Nome�s high school graduation. EVER SO SLOWLY, we�re approaching our goal of $22,450 to replace our studio�s emergency generator, which is inadequate to handle the load of the building. So far, we have been given a total of $9,379 toward the project, with $13,071 to go. Can we �generate� any interest? KEEPS ON TICKING! 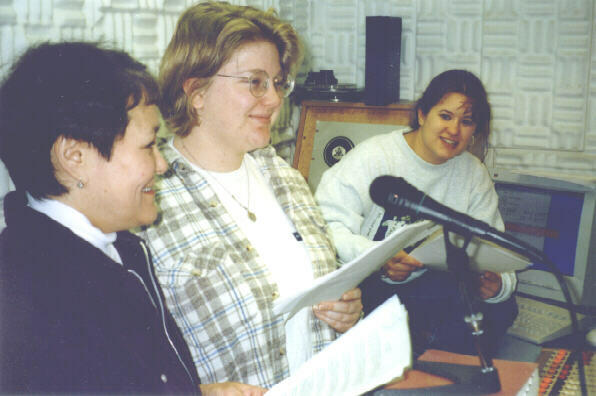 As of July 1, KNOM has broadcast 16,800 Inspirational Spots during 1999, and an equal number of educational ones. Thank you for your support which makes this possible! 25 YEARS AGO: July 14, 1974: KNOM celebrated its third birthday by announcing that on August first, the station would increase its hours on the air from 16 to 18. Meanwhile, the rising price of gold encouraged Nome�s local gold mining company to repair its gigantic old dredges, which had been silent for years. INSPIRATIONAL SPOT: Many people can fill your heart. But there is still an empty space. This is a space that only God can fill..
top TIER DROPS: Nobody is happy over the summer�s fishing prospects. In the Nome subdistrict, prospects look dismal for two of the region�s three major salmon runs. Already, officials have called for an emergency total closure on the catch of pink salmon, which have been low in numbers during odd years since 1990. Meanwhile, the state has ordered Alaska�s first �Tier Two� fishery, which restricts fishing for chum salmon to only 20 households, allowing each of these homes only 100 fish for the entire year. This is a very tiny subsistence catch, perhaps 5% of historic catches that residents have used to feed their families. Coho salmon, locally known as �silvers,� are predicted to be a little better in August, though not enough to make up the difference. The result is a tough summer for many of KNOM�s listeners. Thank you for your support for our mission which informs and inspires them, and provides companionship during this difficult time. 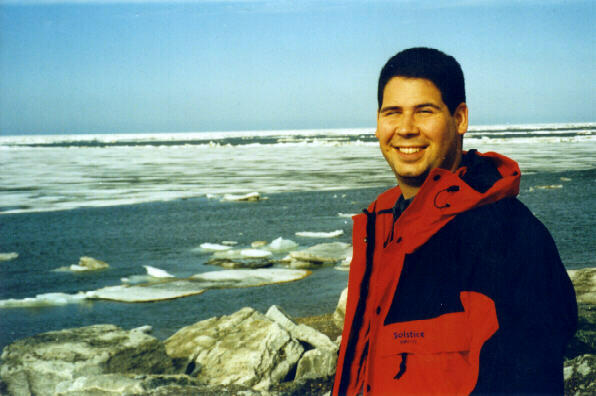 Please welcome KNOM�s newest volunteer, MATT CHRISTY photographed in mid-June standing along Nome�s ice-choked shoreline. From Altoona, PA, Matt is a 1998 graduate of the University of Scranton. Friendly and caring, Matt is already hard at work deejay-ing the morning show, and producing educational spots. Thank you for volunteering, Matt! ICE-CHOKED SHORELINE IN JUNE??? You bet. We had plenty of ice, though by June 19th, it had parted from shore, allowing 54 hardy souls to jump into the Bering Sea as part of Nome�s Memorial Day Swim, which had been postponed. The water temperature was a chilly 34. Brrr! All told, June was actually warm, peaking at +74 on the 20th. That�s about twenty degrees higher than normal, and there were no complaints. www.knom.org is KNOM�s WEB SITE, where you�ll find the �Nome Static� with photos in color, plus many, many historic KNOM photographs, including ancient shots depicting KNOM general manager Tom Busch with dark hair. If you�re not a �web surfer,� you might have a relative who is. Many public libraries offer free web access, and are usually happy to help novice computer users. Please look for us! 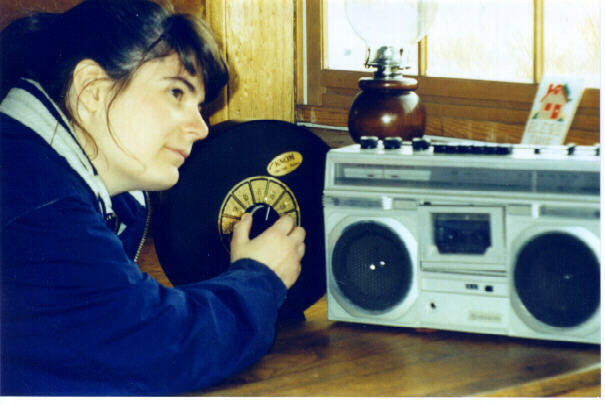 KNOM is the nation�s oldest Catholic radio station, beaming with 25,000 Watts throughout isolated western Alaska. We�ve beamed God�s Love to dozens of remote Eskimo, Aleut and Athapascan Indian villages since July 14, 1971. Throughout the vast region, more than 94% of village adults listen every day. They depend upon KNOM, not only for news and for weather (which can be life-saving), but also for inspiration and companionship. For many, KNOM�s broadcast of the Mass is their only way of participating in the Holy Sacrifice for weeks at a time. Except for occasional grants, this award-winning mission is funded entirely by contributions by individuals like you. Thank you! INSPIRATIONAL SPOT: An apology is a great way to have the last word.